The parents of young woman from Littlehampton who died earlier this month has paid tribute to their ‘inspirational and beautiful’ daughter. Megan Spence passed away in hospital in Belfast on Saturday, January 7, at the age of 22, surrounded by her family and friends. In a message to her many friends, her dad Mark Spence posted on Facebook: “Our wonderful beautiful daughter Megan Spence has gained her wings today. Megan, a popular former pupil at St Philip Howard High School in Barnham, was born in Belfast, Northern Ireland, moving to Littlehampton with her family aged seven or eight. She was diagnosed with acute myeloid leukaemia in August 2015, aged 20, the day she was due to start a work placement while studying at Bournemouth University. In her blog, called ‘welcome to the bald side’, she spoke candidly and often humorously about her condition, treatment and bone marrow transplant in 2016 thanks to her ‘amazing’ brother Shane’s cell donation. It was read by thousands of people, inspiring many with similar health conditions. Hundreds of people attended her funeral in Belfast last week. Megan’s mum Annemarie Spence said: “It’s been quite humbling the volume of people who came, the chapel was packed with around 300 people. “There was about 53 people over from England, some of her Uni friends, friends from Littlehampton and St Philip Howard. She said: “She was ill for about two-and-a-half years. “In this day and age you think we beat these things, but despite the very best of care at Southampton Hospital, she couldn’t. Paying tribute to her, Mark said: “She was always determined she was going to get to everything, regardless of how she was feeling, her life was all about that. He said: “We probably have the same sense of humour. She was the big organiser, she organised her friends, where they would always go. “For her school prom she organised an open top bus for everyone to arrive in, that was her way, she was in the middle of everything. “She really loved to shop, she was a world-class shopper. Writing about her pride in graduating from university on her Facebook page, Megan wrote: “Proud to say that even after everything these past 2 years I will be graduating Bournemouth University with a 2:1! 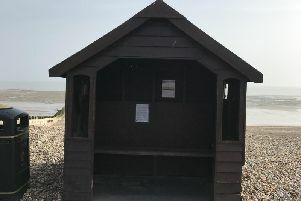 Mark, the chairman of Littlehampton Youth FC, said the family had been heartened by the many messages from people who had been inspired by his daughter’s blog. He said he planned to write a final addition, and said he would also carry on the online business he and Megan set up while she was ill, Foundry Cast Iron, after he had to give up work to look after her. He said: “She had a real spark to get on with life, she finished Uni despite everything and together we set up what’s turned out to be a successful business. He said Megan was able to enjoy a Christmas day with her entire family in Belfast before she was taken to hospital, where she passed away. Mark said her friends at St Philip Howard High School were planning a special celebration of her life, with a date to be confirmed.